I'll remind you about this one again soon, but here's the heads up! You must, must, must come! And not just to see me (though I'll be reading in the Bronx and at Books of Wonder, and I'd love a hello!). 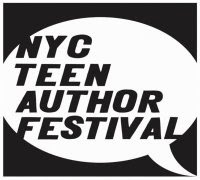 But enough about me; here are the shiny, happy events you can attend if you're in town: Juvenalia Smackdown Monday, 3/16, 4-6pm, Tompkins Square Park branch of the NYPL, 331 E. 10th Street Join Holly Black, Alaya Johnson, Justine Larbalestier, David Levithan, Diana Peterfruend, Scott Westerfeld as they read some of their (ahem) less accomplished work from their middle school and high school years. Hosted by Libba Bray. I Have Seen the Future... and It Sounds Like This Wednesday, 3/18, Mulberry Street Branch of the NYPL Teen authors are notoriously stingy about reading from their works-in-progress. But for Guest of Honor Joe Monti, authors Libba Bray, Rachel Cohn, Eireann Corrigan, Justine Larbalestier, Barry Lyga, and Scott Westerfeld are willing to share a little bit from their future books. Hosted by David Levithan. The Five-Borough Read Thursday, 3/19 BROOKLYN: Central Library, Dweck Center, 10 Grand Army Plaza, Brooklyn 10-11am: Gayle Forman Jenny Han Leslie Margolis Abby Sher Matthue Roth Robin Wasserman BRONX: Bronx Library Center, 310 E. Kingsbridge Road, Bronx 4-5pm: Coe Booth Madeleine George Paul Griffin Brian Sloan Melissa Walker MANHATTAN: Countee Cullen Branch, 104 W 136th St 4-5pm: Matt de la Pena Daphne Grab Mary Hogan Bill Konigsburg Barry Lyga Carolyn MacCullough MANHATTAN: Jefferson Market Branch, 425 Avenue of the Americas 4-5pm: David Levithan Bennett Madison Laura McLaughlin Billy Merrell Marie Rutkoski MANHATTAN: Webster Branch, 1465 York Avenue 4-5pm: Lisa Ann Sandell Courtney Sheinmel Rachel Vail Cecily Von Ziegesar Martin Wilson QUEENS: Far Rockaway Branch, 2002 Cornaga Ave, Queens 4-5pm: Tara Altebrando Laura Dower Heather Duffy-Stone Aimee Friedman Eliot Schrefer Siobhan Vivian Rita Williams-Garcia STATEN ISLAND: St. George Library Center, 5 Central Avenue 4-5pm: Kate Brian Judy Goldschmidt Michael Northrop Micol Ostow Lynn Weingarten Rock Out with TIGER BEAT! Thursday, 3/19, 6pm at Books of Wonder By day, Libba Bray, Daniel Ehrenhaft, Barney Miller, and Natalie Standiford are upstanding authors. But by night, they turn into... TIGER BEAT, the first ever YA author rock band. Tonight is their debut public performance... and it's sure to go down in legend. With opening act The Infinite Playlists (Rachel Cohn and David Levithan reading a litany of musical references, but mercifully not singing). I Love You, New York: Teen Lit in the City Friday, 3/20, 6pm, NYPL, 42nd Street, Court Room Join authors Coe Booth, Paul Griffin, Maureen Johnson, David Levithan, Cecily von Ziegesar, and Rita Williams-Garcia in a spirited reading and discussion about teen novels set in New York City--from the glamour of the gossip girls to the grit of the Bronx projects, from the everyday battles of the high school halls to the extraordinary events of 9/11. Stuff for the Teen Age Ceremony Saturday, 3/21, 1pm, NYPL, 42nd Street, Celeste Bartos Forum This new list only has the best of the best, and includes books, music, movies, and video games. Featuring a keynote by Walter Dean Myers Teen Authors Celebrate Teen Readers Sunday, 3/22, NYPL, 42nd Street, Trustees Room, 1pm Over a dozen authors salute teen readers and teen advisory board members from around the city, including Blake Nelson, reading from his upcoming novel Destroy All Cars. The Biggest Teen Author Signing EVER Sunday, 3/22, Books of Wonder, 4pm Join over 40 authors for a signing extravaganza as they take over Books of Wonder, sign books, and converse with fans new and old. An incredible event that is sure to go down in book-signing history. Authors include: Nora Baskin Jessica Blank Judy Blundell Coe Booth Elise Broach Susanne Colasanti Sarah Darer-Littman Matt de la Pena Heather Duffy-Stone Gayle Forman Aimee Friedman Madeleine George Maureen Johnson Kristen Kemp Justine Larbalestier David Levithan E. Lockhart Barry Lyga Carolyn Mackler Sarah MacLean Megan McCafferty Laura McLaughlin Neesha Meminger Billy Merrell Blake Nelson Micol Ostow Matthue Roth Marie Rutkoski Lisa Ann Sandell Courtney Sheinmel Abby Sher Brian Sloan Rachel Vail David Van Etten Ned Vizzini Adrienne Maria Vrettos Cecily von Ziegesar Melissa Walker Robin Wasserman Scott Westerfeld Suzanne Weyn Maryrose Wood Lizabeth Zindel Can you stand it? I'm going to be gushing all over the place!